March 4 may seem like any other day to most people. 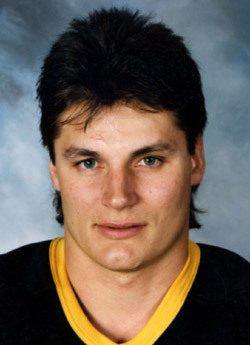 However, on that date in 1991, the Pittsburgh Penguins franchise changed forever. That’s when Penguins General Manager Craig Patrick swung a deal with the Hartford Whalers that brought center Ron Francis and defensemen Ulf Samuelsson and Grant Jennings to Pittsburgh for John Cullen, Zarley Zalapski and Jeff Parker. The result: two Stanley Cup championships and several years of NHL dominance. At the time, no one knew the trade would have that impact. Patrick was just looking for a spark and needed to add second-line center and more toughness on defense. “Certainly, we weren’t a championship-caliber team, in my opinion, until we made that deal to get Ronnie and Ulf and Grant Jennings,” he said. “We had made a lot of changes that whole season, but that was the icing on the cake. 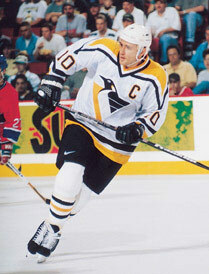 Clearly, Patrick wasn’t alone in his opinion that the Penguins needed to make more upgrades for the postseason. “We were on one of those Western Canadian swings,” said Penguins radio play-by-play announcer Paul Steigerwald. “We were in Calgary [on March 1] and there was a replay of a play around the net and the camera was from above and every Calgary Flames player was around our goal cage. We had no presence in front of our net whatsoever. We commented on the air about it and I will never forget it because the picture was so poignant because you can just see this sea of jerseys around our goal and they were all Flames. “So, we went into Vancouver and [Penguins head coach] Badger Bob [Johnson] was standing at the top of the escalators at the Pan Pacific Hotel. We were standing there talking about it. He said, ‘Well, you see what we’ve got back there.’ That was probably the most negative thing he ever said about our team. He was just a guy who was never critical of the players and always tried to pump them up. It didn’t take long for Patrick to find a solution. The deal had an immediate impact as the Penguins went 6-0-1 in its first seven games following the trade. They closed the regular season with a 9-3-2 run to win their first Patrick Division title. Francis had 11 points (2+9) in those 14 games, while Samuelsson had five points (1+4) and 37 penalty minutes. Jennings played in 13 games and had four points (1+3) and 26 penalty minutes. “I knew that Ronnie Francis was an elite guy in the NHL,” said Penguins radio color analyst Phil Bourque, who played for the Penguins from 1983-92. “I didn’t know a whole lot about Ulfie Samuelsson except that a week or two weeks before that trade, he beat up a Zamboni with his stick as he was going off the ice in Montreal. I knew he was pretty frustrated in Hartford because they really hadn’t won there much. The trade helped the Whalers, too. They made the playoffs in 1991 and ’92. At the time, some actually thought the Whalers got the better end of the deal. “People were saying that in Hartford because they had soured on Ronnie Francis and Ulfie was talking about going back to Sweden because he was so upset,” Steigerwald said. In addition, Eddie Johnston was Hartford’s general manager at the time. He was the Penguins’ head coach from 1980-83 and general manager from 1983-88 before serving as Whalers GM from 1989-92. Therefore, some believed he had an advantage because of his knowledge of the Penguins’ personnel. “We thought at the time it was a good trade for both teams. It worked for both teams,” said Johnston, who returned to the Penguins as head coach from 1993-97 and currently serves as assistant general manager to Patrick. “It worked out terrific for the Penguins because they went on to win a couple Stanley Cups. I think it was probably the piece they needed. 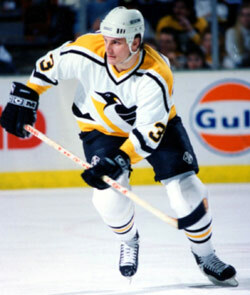 They had Mario [Lemieux] and they needed another top-notch center iceman and they got a great player. I am sure Ronnie’s going to end up going into the Hall of Fame. It was a trade that we thought, at the time, was beneficial for us. We needed a defenseman and we got Zalapski, who ended up scoring 20 goals for us. They ended up with a character player and a Hall of Fame player. 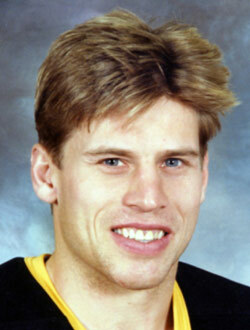 Cullen, a forward, had 94 points in 65 games for the Penguins before the deal. 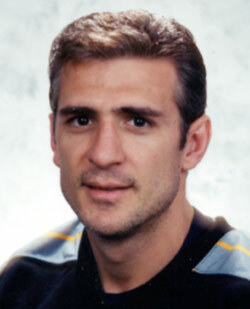 He had 16 points (8+8) in 13 games for the Whalers after the trade. However, it was his leadership that nearly caused the Penguins to cancel the whole transaction in the first place. “We knew the trade was giving us certain parts that we needed to be even more successful than we were,” Patrick said. “It was hard to give up what we did, especially Johnny Cullen. Zarley Zalapski had a lot of promise at that point in his career, too. But, we were really concerned about our chemistry because John was a big part of our chemistry on the team at that point. So, it was a major concern. The move sent shockwaves through the Penguins’ dressing room. “I remember when I heard about the trade, it was bittersweet for me,” Bourque said. “One of my great friends, Johnny Cullen, was getting traded. Not only was he one of my great friends, but he was really the glue of our team because Mario was [injured for a while] and Johnny was the guy who actually carried us and kept us afloat and put us in a position where we could make a run with Ronnie and Ulfie and Grant Jennings to actually get in the playoffs. “At that point, if it wasn’t for Johnny Cullen, I don’t think our team [would have been] in position to make the playoffs when those guys came in – I think we [would have been] too far out of it. ‘Cully’ had a pretty good career, but he never got a [championship] ring. The three players certainly filled the void created with Cullen’s departure. It didn’t take long for Francis and Samuelsson to realize they impact they had on the Penguins. 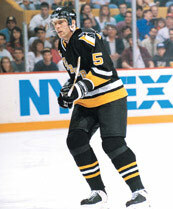 Samuelsson gave the Penguins a physical edge with his toughness. Meanwhile, Francis brought his well-rounded threat at the center position to Pittsburgh. “What’s interesting is that Ronnie was a No. 1 center in Hartford, but he was a No. 2 center here and he was the perfect second-line center because he could give you offense, but he could check and win draws,” Steigerwald said. “He became the guy in the middle who could really solidify things defensively for you. He was the defensive conscious of the team. Jennings provided the Penguins with solid defensive play as well. With their new additions, the Penguins knew they had something special brewing. The Penguins went on to capture their first Stanley Cup that year. A season and a few more changes later, they won the Cup again. 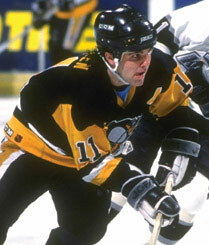 While all three players flourished with the Penguins, Francis elevated his career to an elite level. 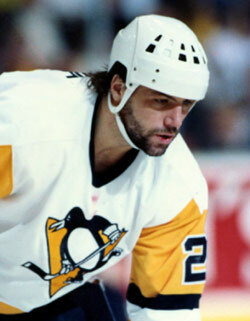 He racked up 613 points (164+449) in 533 regular-season games and 100 points (32+68) in 97 playoff contests in eight seasons with the Penguins. He retired this season with 1,798 points – the NHL’s fourth-highest point total. He had 549 goals and 1,249 assists in his 23-year career. Francis will be eligible for Hall of Fame induction in 2008. See you in Toronto.